"I don't need a bath. I just licked down there." This one follows the law of diminishing return, at least when it's applied toward the concept of movie sequels. 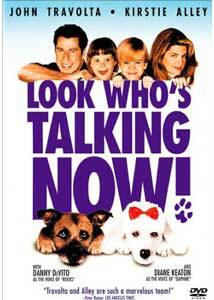 Look Who's Talking, released in 1989, proffered a few laughs in a film where John Travolta and Kirstie Alley raised a baby whose wisecracking thoughts were voiced by Bruce Willis. A by-the-numbers sequel followed a year later, operating under the premise that if one talking baby is funny, then two will be even funnier (with the always unfunny Roseanne Barr providing the voiceover, along with Willis). Tom Ropelewski, who wrote and directed this last (I hope) installment in the series, ditched the obvious idea of adding a third talking baby in favor of adding two talking dogs. In this chapter, James (Travolta) and Mollie (Alley) are busy raising the two tykes from the previous films, Mikey (David Gallagher) and Julie (Tabitha Lupien). James' sexpot boss Samantha (Lysette Anthony) is trying desperately to get in his pants, so as some sort of angle to get at the man through his daughter, she gives the family her pampered poodle Daphne (voiced by Diane Keaton). Of course, madcap comedy requires two dogs, which happens when James and Mikey just happen to come home with gruff mutt Rocks (voiced by Danny DeVito) on the same day that Samantha is dropping off Daphne. As much as I think Danny DeVito is a fairly funny guy, there is something acutely embarrassing listening to him lifelessly reading tired jokes that are played over "cute" reaction shots of a dog. In his defense, DeVito can at least deliver the lines with a modicum of humor, as opposed to the painfully phoned-in read delivered by Keaton. I know that this was made in the pre-Babe sophisticated talking animal era, but still... At least Mr. Ed could move his lips. If we're only supposed to be hearing their thoughts, how can it be that they can communicate with other animals? Does this mean all animals are psychic, and that Chihuahuas think with bad Spanish accents? Ropelewski veers off what I perceived as the film's intended path a few times, as the action is an uneven blend of part talking dog movie (a relatively small chunk, in fact), part Christmas movie, and part stale sitcom. As a family film, it's not a complete loss, though. My eleven-year-old daughter got a few laughs out of it, and she thought the dogs were cute, but even she admitted that the pooches were used far too sparingly. Image Transfer Review: A serviceable, relatively clean 1.33:1 full-frame transfer from Columbia TriStar on this one. The source print is solid, with only a few significant specks. Colors are reproduced naturally and appear fairly bright, while flesh tones are accurate and black levels are generally well defined. Audio Transfer Review: No beefs with the tame 2.0 surround track. As expected, there isn't much in the way of flashy audio pyrotechnics to be found here, but that omission doesn't hurt a film like this. Dialogue is clear, and there wasn't any hiss. Extras Review: Other than a trio of animalistic trailers (Look Who's Talking Now!, Stuart Little, Soccer Dog), Columbia has provided 28 chapters and their usual United Nations-worthy supply of subtitle options (English, French, Spanish, Portuguese, Chinese, Korean). Third time is not a charm for a franchise that has seen better days (actually only one "okay" day, now that I think about it). Kids might like this one, but the humor is a little weak to satisfy the adult crowd, despite the un-kid-friendly adulterous boss storyline.